Donostia San Sebastian really has it all. Great beaches, fantastic food and lovely (food obsessed) people (oh and oodles of shoe shops – if that is your thing). 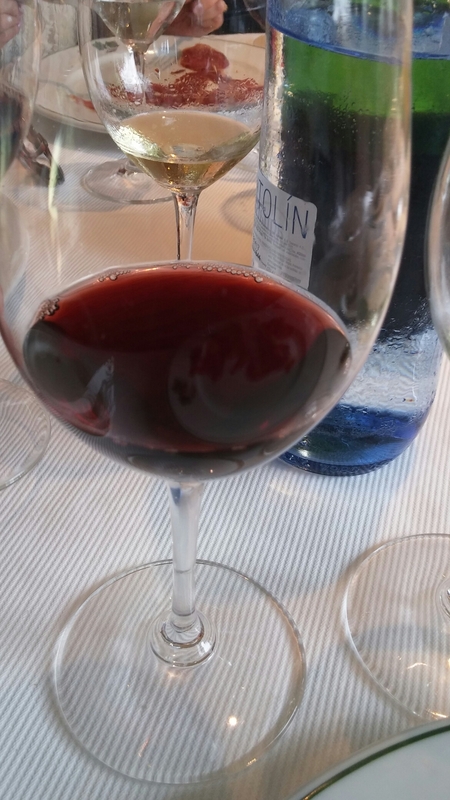 It is also close (1.5 hours drive) to my favourite wine region, La Rioja, with La Rioja Alavesa being part of Pais Vasco (the Basque Country) and on the wine front Donostia San Sebastian has a restaurant, in the form of Rekondo, that has to have one of the world’s great wine lists (with a cellar holding well in excess of 120,000 bottles). They have so many bottle that they sell some of the older stuff at knock down prices. This is stuff you in reality will not be able to find anywhere else in the world and (even if you could) here it is at prices that quite frankly put most, if not every, restaurant in the UK (and the US) with pretensions of having a half decent wine list to utter shame. Even the newer stuff is sold at bargain prices. 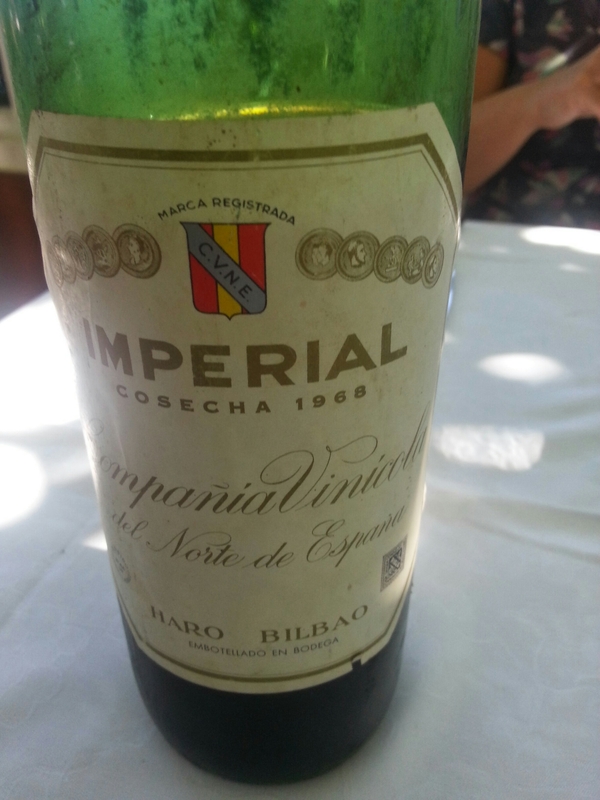 On a previous visit, Mrs. SF and I had a 1968 CVNE Imperial for the frankly ridiculously low price of €59 (about £43 – could even have been €49) . A beautiful, elegant wine which was as fresh as a daisy. Retail wise on Winesearcher it goes for around €150 (in Spain). On this basis I dread to think how much it would cost if on a UK restaurant list (£200+ I suspect). A story goes (not sure if it is an urban myth – can’t find it on the internet) that it was cheaper for the LA Times’ (or similar paper) wine correspondent to fly to Madrid (allegedly business class), hire a car to drive to Donostia San Sebastian stay overnight and buy a particular expensive wine (Chateau Le Pin or Petrus or something of that uber expensive ilk) at Rekondo than for that person to buy the same wine at the famous The French Laundry restaurant in California. It is one of those stories that certainly has a ring of truthfulness to it as wine at the French Laundry is hideously pricey and wine at Rekondo is joyously cheap. Anyhow, a group of 6, including Mrs SF and I, in Donostia San Sebastian for a week of food, food, more food and wine and more wine, took a break from the pintxos bars and trundled up to Rekondo for lunch with high expectations (certainly on the wine front). Set in the hills above Donostia San Sebastian, it has a fantastic terrace with beautiful views of the bay to the North and the hills/mountains of the Basque Country to the South. Whilst a pleasant enough day it was not quite warm enough to sit on the terrace and we had a table in the main restaurant area. with a stunning indoor charcoal grill (it being an Asador – Spanish for a barbecue, grill restaurant) with white hot coals as we walked past it. 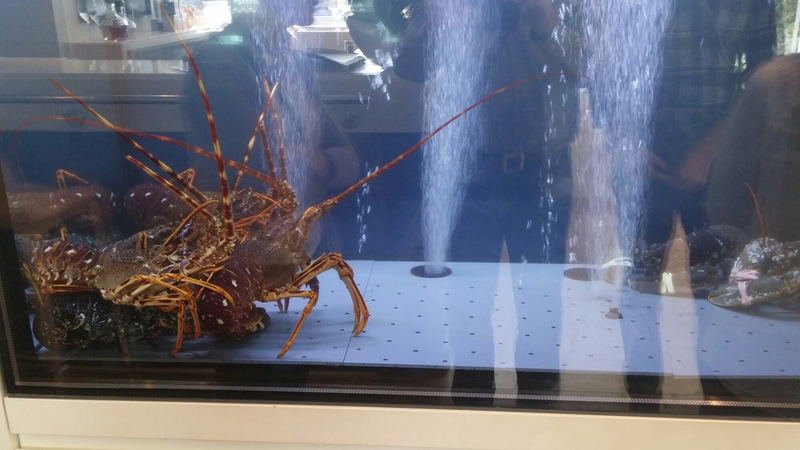 Forgot to take a picture (darn it), but here is one of some lobsters instead (rather cruelly placed in a tank in direct line of sight of the indoor charcoal grills where their brethren are cooked – not sentimental about food the Basques). It is a nice dinning room – classy but with a welcome informality to it. 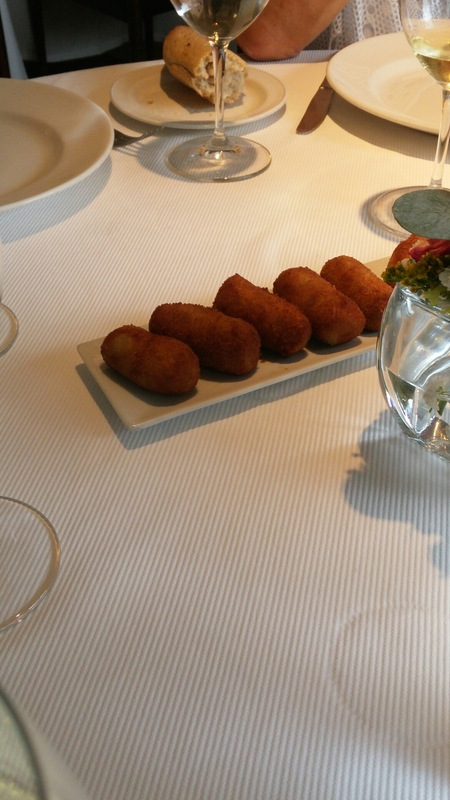 We started off with some complimentary and rather good iberico jamon crocquetas whilst we perused the nicely succinct menu. This is split into entrees/starters and mains. To my mind, at first sight at least, the entrees/starters are a bit on the steep side on the price front. 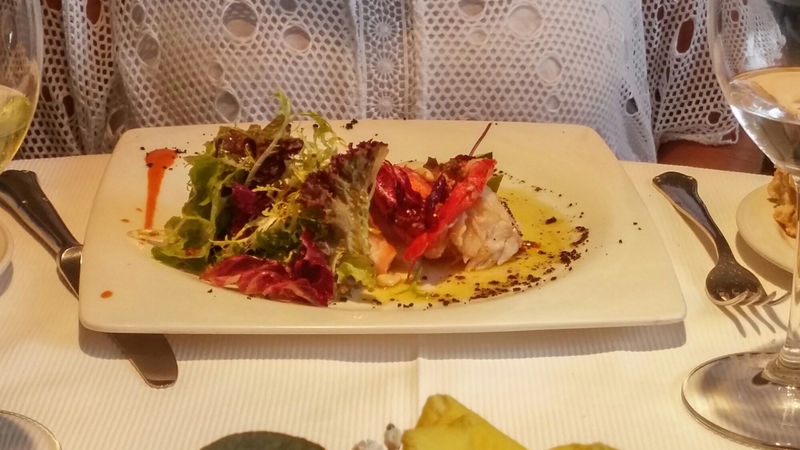 I had a perfectly nice dish of wood roasted piquillo peppers from Lodosa stuffed with oxtail (€18). 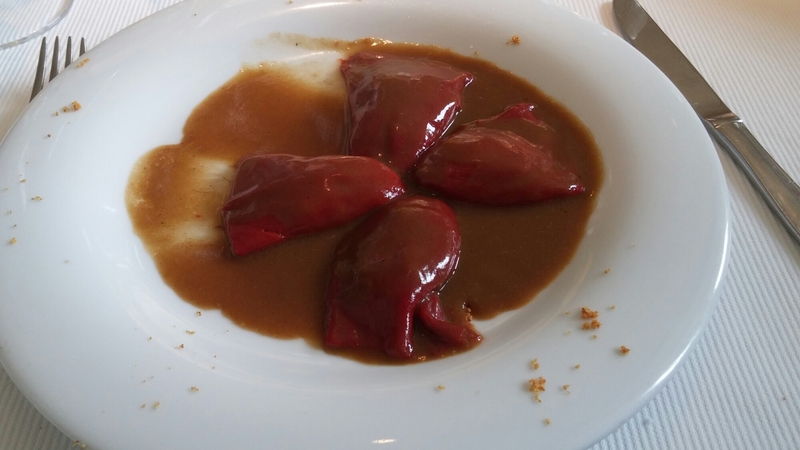 Whilst it was very tasty (with melt in the mouth oxtail and a great sauce the price for 4 smallish stuffed pepper (even though piquillo peppers are not cheap) did seem a bit on the hefty side. Again this was expensive, but it was top quality iberico jamon and lomo (which never comes cheap) and was an enormous portion. My advice with these starters/entrees is if you are going to order them (mains are huge so no real need) then share. 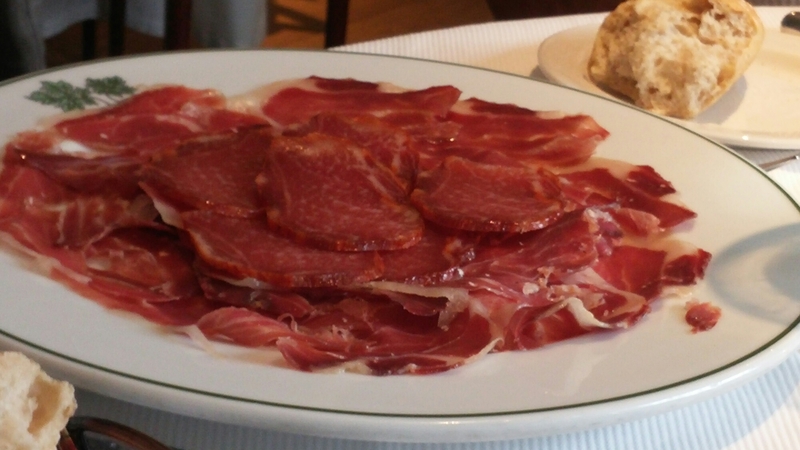 One plate of the iberico jamon and lomo is enough for 2 or more. I had to “help” Mrs. SF finish her plate off (obviously I protested vigorously before being brow beaten into doing so). 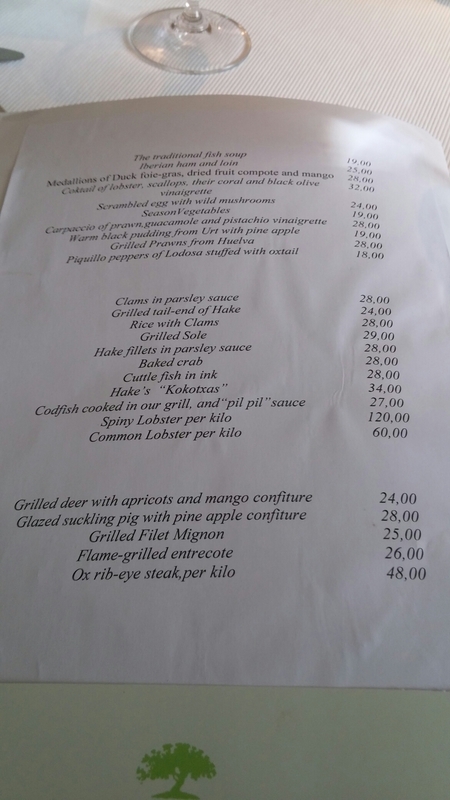 The mains are relatively simple affairs, with grilled or baked fish (and shellfish) as well as steaks and some other items (game, suckling pig). 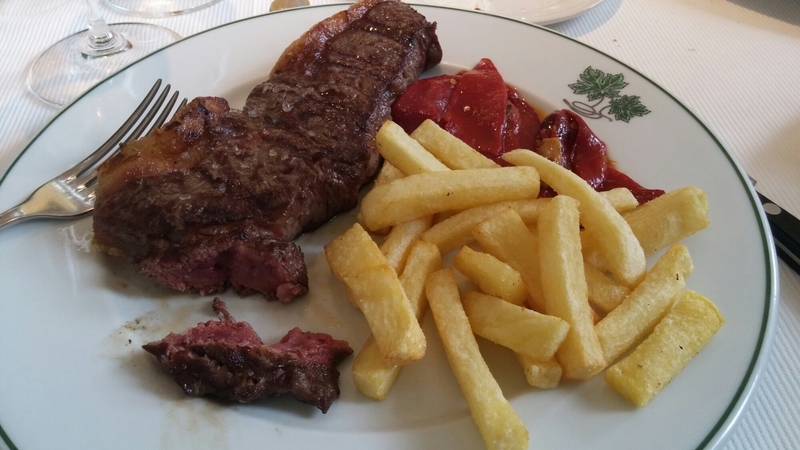 I tried and failed to get someone to share with me the 1kg plus ox steak (€48 per kilo) and whilst tempted to go for it solo, common sense prevailed. 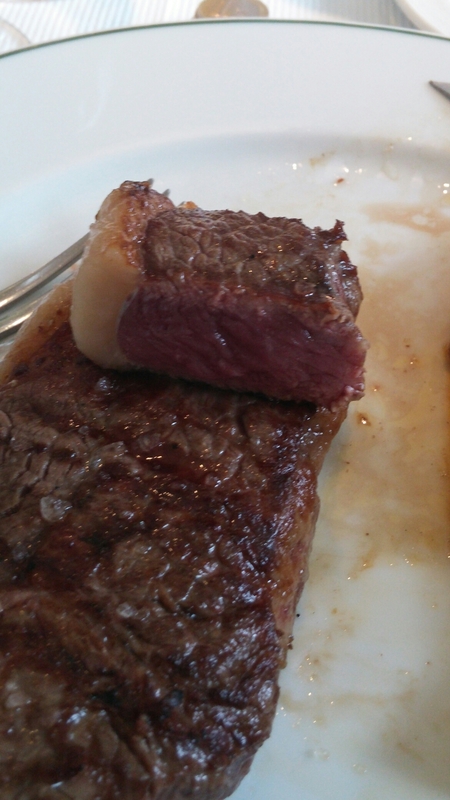 This was a perfectly cooked (as per my request) huge hunk of prime dry aged beef with a lovely bit of fat on it. It was incredibly tasty and deeply satisfying. 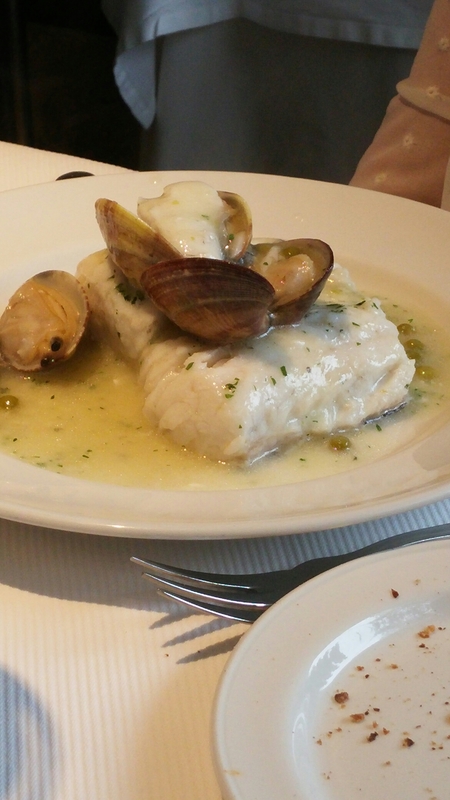 and two big pieces of baked hake in a parsley and shellfish sauce, with clams (€28). Be warned, make sure you have a good appetite if eating here as portion sizes are on the very substantial size. Simple, but effective, cooking of quality ingredients sums up the food here. 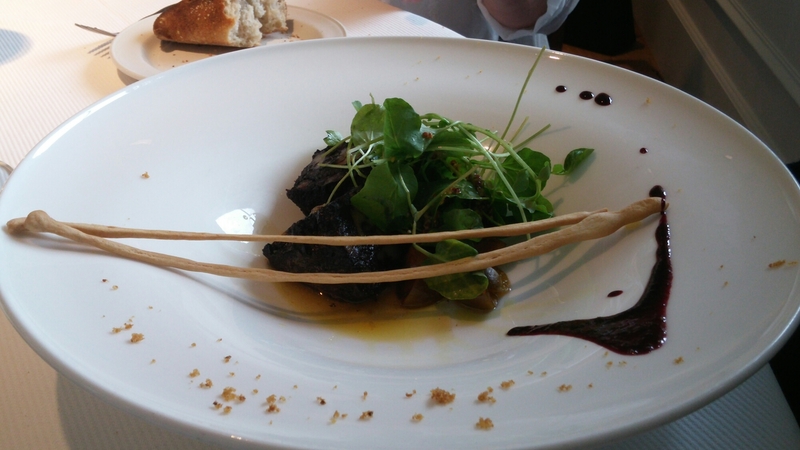 Food designed to compliment rather than overawe the stellar wines on offer, which brings me rather neatly to the wine. The wine list in this place is monumental and, whilst focussing on Spanish wines (my particular passion wine wise, with an amazing selection of old vintages here), it covers all the classic wine regions with some corking Bordeaux wines (think Le Pin, Petrus, Latour, Chateau Margaux and Yquem to name, but a few – I saw at least 6 Methuselahs of the latter in the cellar!!!!). 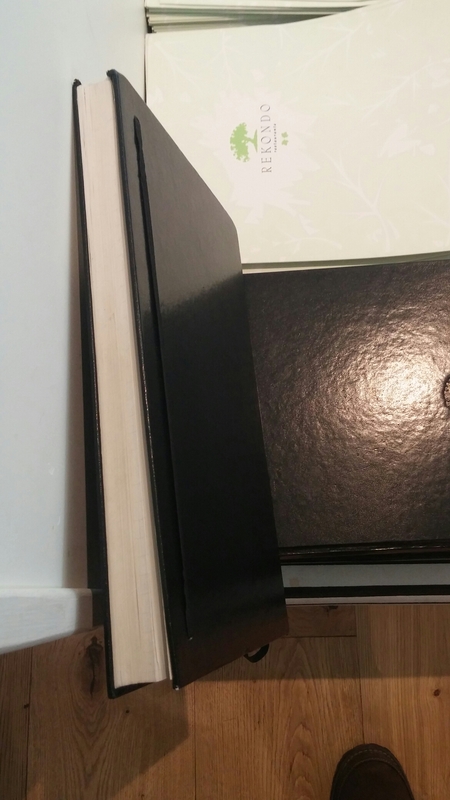 I could have happily spent all day flicking through the wondrous tome that is the wine list at Rekondo. I, however, had to chose some wines (a white and two reds) without going mad (tempting as it was). Lovely fresh peach and citrus flavours, with a nice minerality (the latter reminiscent of a good Riesling), this was a very good match for the seafood elements of the meal. 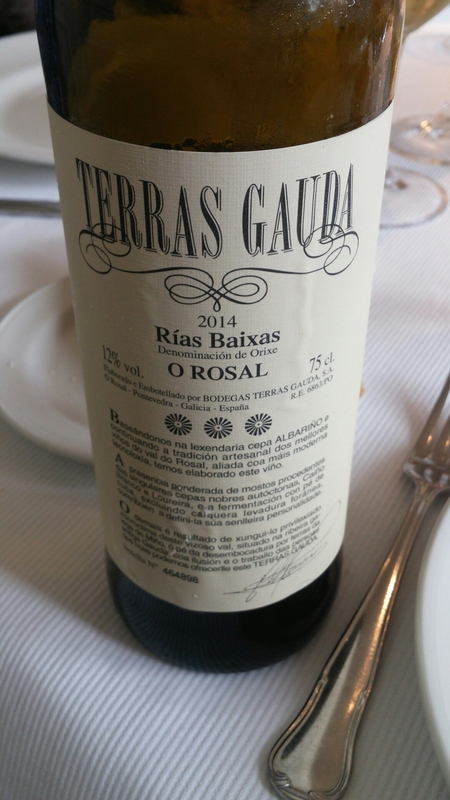 The price here was €20 (£14.20), whereas the price of this wine on Nathan Outlaw’s wine list is £59 (€83). So that is a saving of just under £45. The Rekondo price is actually cheaper than I can get this wine retail pretty much anywhere in the UK (other than at Costco – where it is an absolute steal at £10.80). Moving on to the reds, I already had an idea of what I wanted to find on the list and it didn’t disappoint. 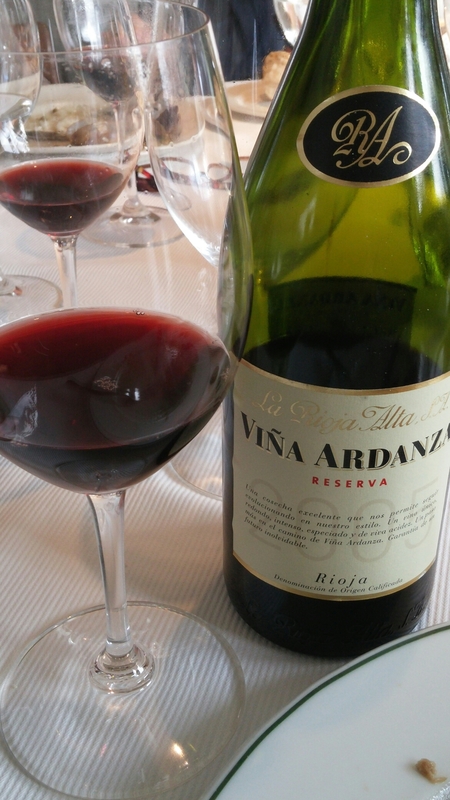 First up was something from the La Rioja Alta winery (a firm favourite of mine). This had opened up beautifully, with the tannins much softer then was the case last year. It had nice aromas of strawberry and on the palate there was cherry, vanilla and a nice herbiness (a hint of mint and anis) to this wine. Great with my hunk of beef. On the pricing front, retail in the UK you are talking between £20 – £25 for this wine. In terms of restaurant prices, the Walnut Tree Inn in Wales has a Vina Ardanza 2005 on its list for £49. So you are looking at a saving of over £31. 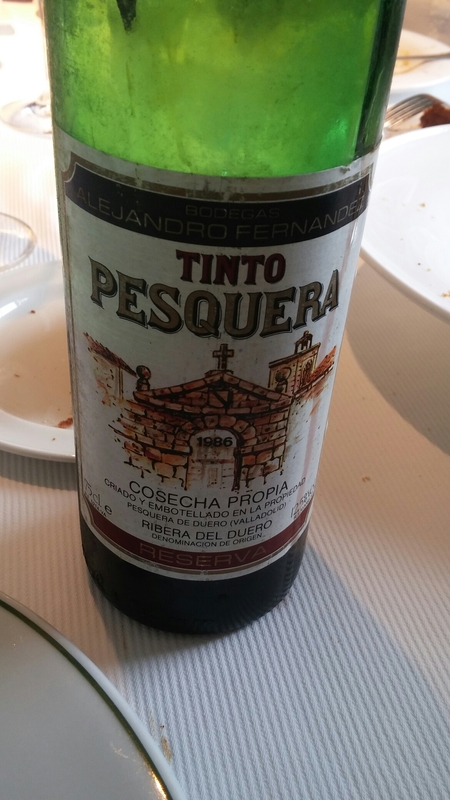 The other red I picked from the list was a Pesquara Reserva 1986. This is a classic Ribera del Duero wine, with the 1986 vintage described by Jancis Robinson as a year “of Riberas of complexity and power”. I found it on the list amongst a multitude of other Pesquara vintages for a price of €70 (around £48). A beautifully vibrant wine, with a deep rich colour belying its age. On the nose there was cherry, with hints of tobacco. On the palate it was remarkable fresh, with cherry again but also cedar and tobacco (think cigar box). A lovely wine which was a joy to drink. Be warned it throws a fair bit of sediment. Some of you may think I am mad spending £48 on one bottle (cost was shared between 6 of us), but that is the beauty of this place. You find wines that you may never see anywhere else at prices you cannot resist. I found this wine retail (albeit from a pricey retailer) for €133.99 (about £98). Think about that – in this restaurant I can get this wine for about £50 cheaper than I could buy it in a shop! Crazy or what! God only knows what it would be on a UK restaurant list ( If you could find it I suspect it would be £150 – £175 +, so well over a £100 saving). 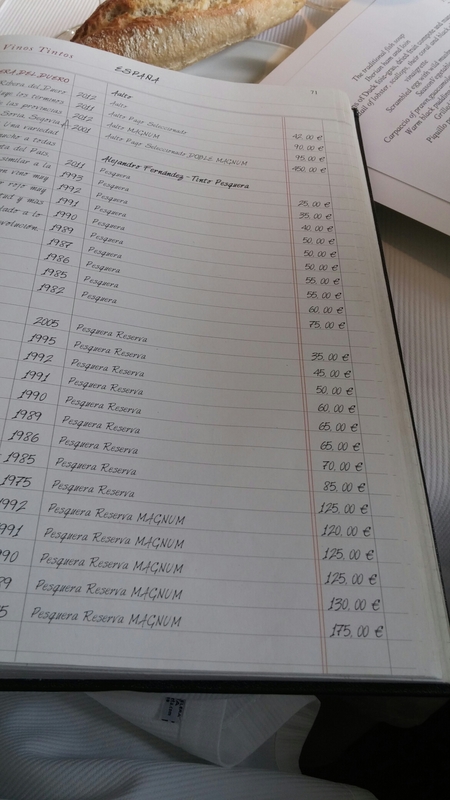 To further put the wine prices here in context, Restaurant James Sommerin in Penarth has on its list a Pesquera Crianza 2011 for £47.50 (about €67). Retail you are talking £20+. 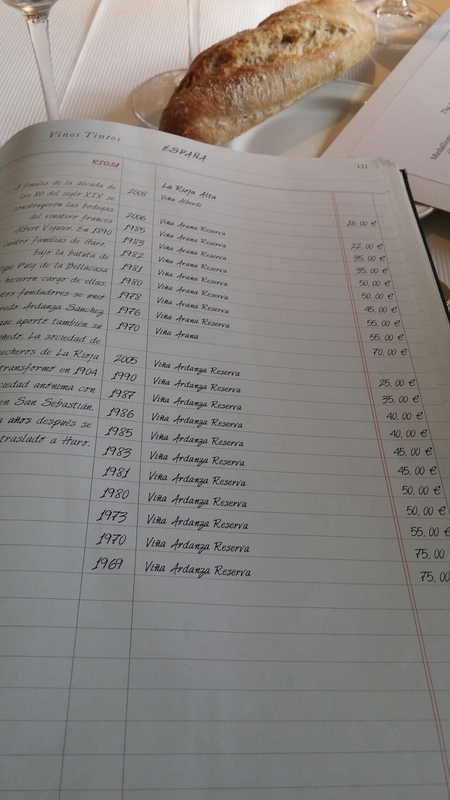 The price at Rekondo for that wine is €25 (about £17.50). Adding it all up and the savings we made on just those 3 bottles of wine (as against UK restaurant prices) came to around £175. That was more than the cost of the flights over there for Mrs. SF and I. Buying these wines at Rekondo was also remarkably cheaper than I can get them retail in the UK. If you stretch the budget saving go from very good to amazing. 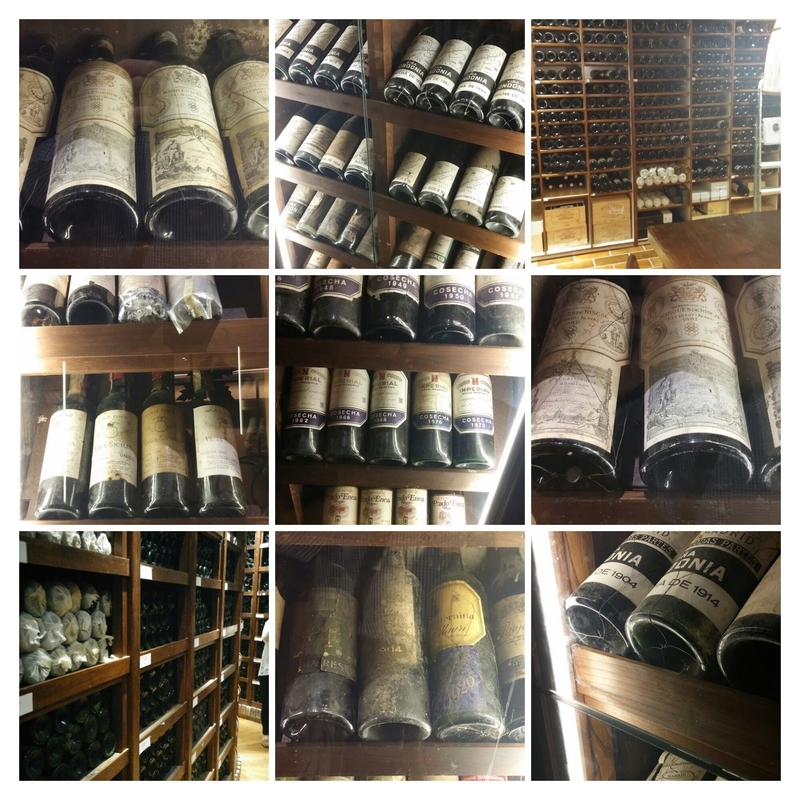 Their cellar is a truly amazing place – my idea of what Heaven should look like. I wonder if they would allow my ashes to be scattered down there? At Rekondo it is really all about the wine. 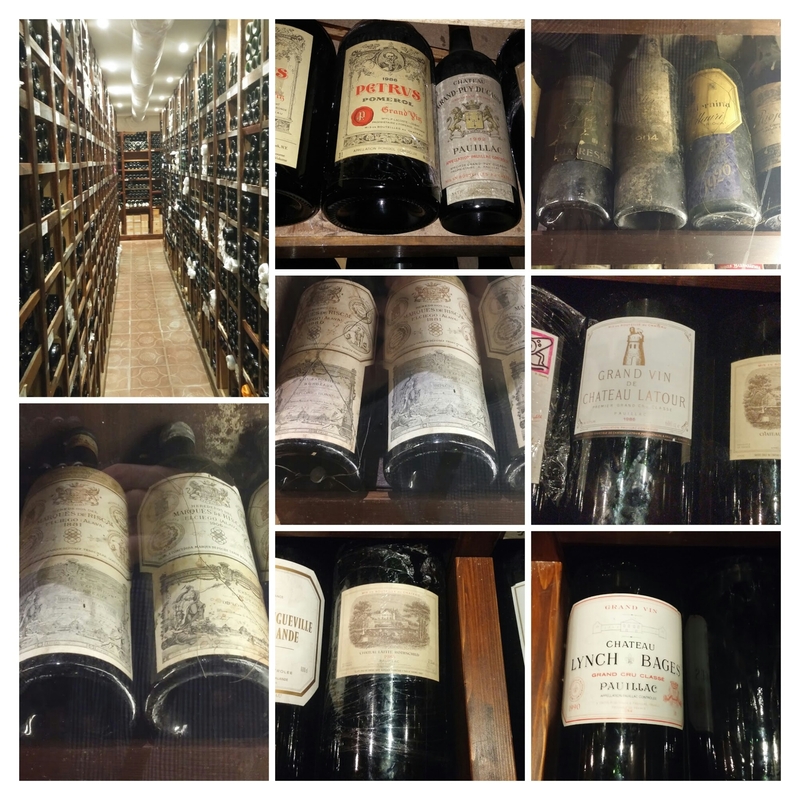 It truly is a wine lovers paradise where you can explore a list (like no other) that offers wines you are unlikely to find elsewhere (at all and certainly not at the prices at Rekondo). 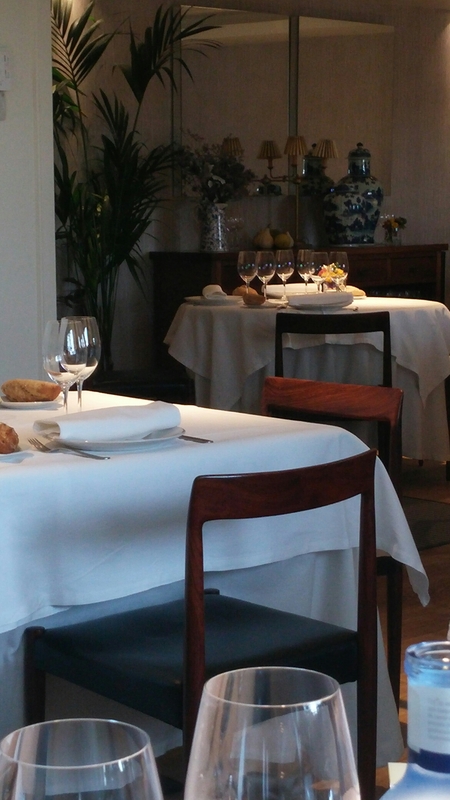 On the food front it is unfair (as some have done) to compare Rekondo to the “temples of gastronomy” in Donostia San Sebastian like Arzak, Akelarre and Martin Berasategui. Here there is no experimentation with bizzare flavours combinations or molocular gastronomy. 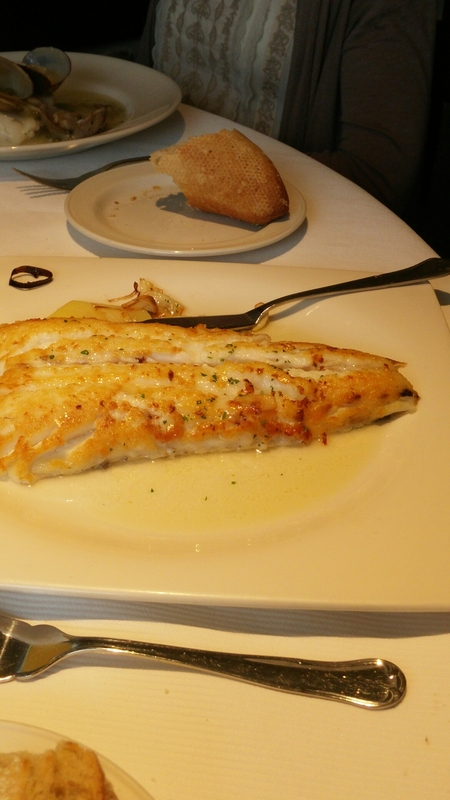 What you get is simple, but tasty food that complements its awesome wine list. You don’t want anything that clashes with the great wine you will order and a nice piece of steak or grilled fish is really all you need with a cracking bottle of wine. 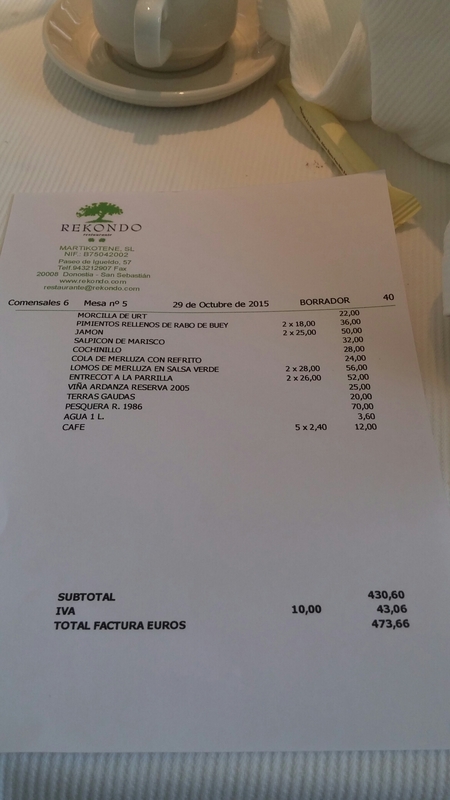 The damage was €473.66 (excluding a tip – we gave one) for 6 of us. In UK money that is about £330. Whilst far from cheap, with the wines it was a bargain as against what we would have paid in the UK. If we had been more sensible re starters the price would have been a fair bit cheaper. Personally I thought two plates of the iberico jamon and lomo would have been enough for all of us with the size of the mains. Would I go back? Oh dear God yes – already planning next visit to Donostia San Sebastian and Rekondo will always figure in any trip there. 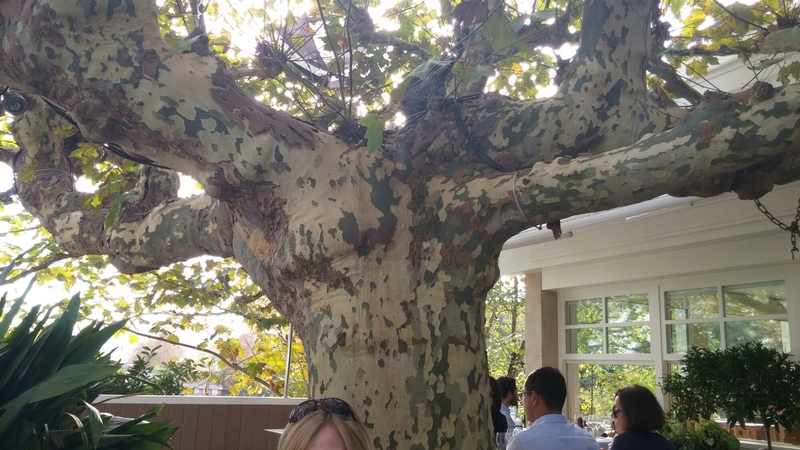 This place should be on every wine lover’s bucket list. Just fantastic. 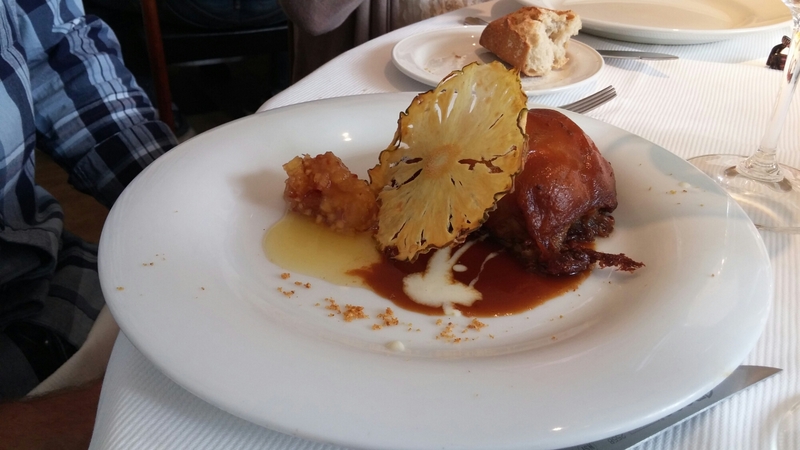 This entry was posted on Nov 22, 2015 by solicitingflavours in albarino, Alcoholic drink, Alternatives to sauvignon blanc, Barbecue, Basque Country, BBQ, Charcoal BBQ, City break, Donostia, Drink, Dry white wine, fish, Food, Food and wine products, French wine, Galcian white wine, Godello, La Rioja Alta, lobster, lunch, lunchtime, outside UK, Outside Wales, Pesquara, Pork, Red Wine, Rekondo, Restaurant Review, Rioja, San Sebastian, Spain, Spanish wine, steak, Steak house, Tempranillo, Terra Guada, Travel, txakoli, Verdejo, White wine, wine, wine mark up.